Innovation built into old school design. Even the pricing is throwback. Old-school lace design with white sidewalls. A pure throwback to a classic style that set the stage and informed the world what riding was all about. It still does. Throw a leg over the Victory High-Ball. Wherever you want to go from here, these wheels will take you. The best performing transmission on the street collects the power generated by the massive V-twin and allows the Vegas High-Ball to roll fluidly between the curbs. Helical-cut gears ensure that each shift will be as smooth and clean as the bike itself. 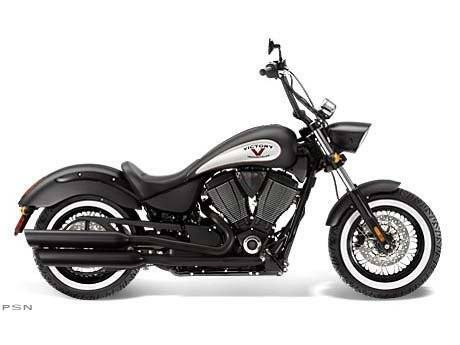 While its style says vintage, the Victory High-Ball makes modern motorcycle history when it comes to the horsepower department. The whopping ninety-seven horsepower generated by this machine would have made riders back in the day cry for mommy. Make a statement with two fists in the air. These blacked-out apes are what give the High-Ball its signature profile. Feel a little less simian? Pull ‘em down low for a more relaxed, but no less intimidating riding position. Less is indeed more. This shorty front fender offers protection from whatever the road throws your way, yet keeps things simple and essential – true to spirit of the bobber style.